Anyone who subscribes to Blackview email and purchases before October 1st will get 24% OFF and a free gift package which is actually worthy of $40. Hello! I am Alston. Now I am doing BV6800 Pro Giveaway activity survey questionnaire. Please feel free to fill in the information according to your personal situation. Your answer will be kept confidential. Thank you very much for your cooperation, thank you! Thank you for fill in the form. We have received your informations. If you are selected to get free BV6800 Pro we will respond in 8 to 10 days through email. Have you ever wondered if there’s a smartphone that can works in any environment? Wanna make your work and life more vivid? 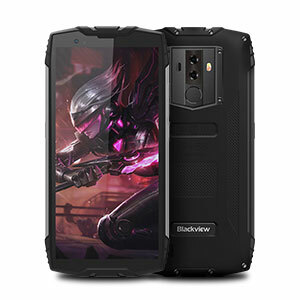 Blackview BV6800 Pro will have the impressive protective capability also make. We are taking that concept and pushing the limits to the next level - a multiple certified rugged phone with 4G compatibility. It is waterproof, dustproof, shockproof, pressureproof and corrosionproof etc, making it is the perfect phone for your outdoor adventures, +business trips, and daily life. Except IP68, BV6800 Pro passed IP69K and MIL-STD-810G Military standard certification. That's why BV6800 Pro has been tested against the toughest family of them all: the Military. Its ensures protection against dust, shock, drops, vibration, extreme temperatures, blowing rain, low pressure, high altitude, salt fog, humidity, blowing rain, water immersion or any enemy your family can dream up next. Just like BV6000, BV6800 Pro passed IP68 test, it can handle depths of even 5 meters for 1 hour and drop it from 3 meters high without any onsequences. The touchscreens on Blackview smartphones are equipped with innovative wet finger tracking technology, meaning you can use the touchscreen as normal even when wet. Which environment can use the BV6800 Pro? Through a lot of users' experience first hand, no matter if you are an outdoor enthusiast (who loves rafting, cycling, hiking, skiing, diving, or surfing) or someone who often works in a tough environment like woodcutters, miners, oilman or construction workers, the BV6800 Pro is for you. Also, soldier, firemen, policemen, and delivery men will find it extra useful. The key difference between both phones — from an aesthetic standpoint — is that the BV6000 has a standard 4.7”HD 16:9 display, with the BV6800 Pro offering a 5.7”FHD+ 18:9 display. Bring you a more stunning vision, more comfortable grip. With a 6580mAh big capacity battery, Li-ion polymer battery core, the BV6800 Pro gives you days of power you can rely on. Our MT6353 power management unit, offers real-time battery health monitoring, smarter charging cycles and battery care technologies all work to monitor the battery’s performance, so you can stay powered up for even longer. As to pull up the feeling of users, BV6800 Pro added wireless charging functionality, adopts with Qi wireless fast charging standard, maximum 10W wireless charging power, charge wireless in wherever offers Qi wireless charger. If you want to enjoy the fun with using BV6800 Pro at work or in outdoor adventures, a big capacity battery is a must-have. BV6800 Pro with 6580mAh BAK battery, customers will receive high-quality user experience, no worrying about charging. It takes only 2.5 hours to complete the 100% injection, benefit by ultra-efficient 24W low-temperature fast charging. People use of storage on their phone has been gradually growing over time, The BV6800 Pro is equipped with a 4GB+64GB large memory. Also custom built with dynamic memory management and intelligent process scheduling mechanism, allowing you to do whatever you like. We upgraded both the software and hardware by the usage of Dual Sony IMX298 16.0MP rear cameras, and offers up a range of shooting modes, hope to bring a “DSLR shooting experience” to you. As a full-function rugged smartphone in a lesser size, only 170g, you could pop it in your pocket and take it anywhere or hang in the Armband will have no burden to everyone. It is a phone which was born to work with you anywhere! With latest Google Pay support, now you can make easy, fast and secure purchases in thousands of retailers, online stores and apps. Other than that, you can also enjoy conveniences like quick data transmission, electronic access identification, etc. Q: What operating system to running? A: Latest Android 8.0 Oreo. Q: Is there any certification for the phone to use in Europe? Q: How to easy operate outdoors? A: BV6800 Pro own tailor-made outdoor tool box. Q: Whether there have navigation function? A: Support GPS + Glonass double star position system. Q: How many sim cards can be in the phone? A: 2 sim & 1 TF card. Q: Where can I buy the phone? A: Currently you can only buy from Blackview Official Mall. Q: How long is the return window? A: Within 15 days of delivery. Q: Is warranty included with purchase? A: Warranty is included up to one year. Q: Is replacement service available? A: Replacement is available within 15 days of delivery. Q: When will the phone be shipped? A: We are expected to ship in Oct. 2018. Q: Which regions are available for shipping? A: We are offering worldwide free shipping to all of our backers. A: The shipping time depends on different carriers and different regions. We will notify you of the delivery time by email when we ship. Q: Can you ship to P.O. Boxes? A: No. We currently do not support shipping to P.O. Boxes. A: If you need to update your shipping address, please contact our customer service team: hujp@blackview.hk. Q: How can I check the status of my pre-order? A: The Blackview team will continuously update the official website and update every backer on the manufacture and shipping process. For more info, please contact hujp@blackview.hk..
Q: What is the test method on MIL-STD-810G? A: Test Method 501.5 High Temperature. Test Method 502.5 Low Temperature. Q: How is the battery life on BV6800 Pro? A: The 6580mAh BAK battery coupled with Android 8.0 Oreo system-lever power optimization offering four days usage. Q: Whats are the box contents? A: You will get the device, protector film,phone case, charger, USB cable and user guide. Who will be the luckyest guy in the world? Great thanks to all participators who joined this activity. Winners, please contact us within 7 working days via email hujp@blackview.hk. Otherwise, it is regarded as an automatic waiver of getting the prize. The giveaway will be ended one day before starting the presale of BV6800 Pro. The prize will be shipped out within two months after the BV6800 Pro starting presale. Winners are solely responsible for all applicable taxes associated with receipt of the prize. Blackview reserves the final rights for this activity. Hi dear friends, you may share this activity to your Facebook or other social in order to increase 50% winning chance. Dear friend, when you have a travel plan, you can send this plan to hujp@blackview.hk. If the travel plan is approved, we can provide some sponsorship support with you.